There is a lot of irony in religious belief. To me the funniest irony is the religious’ utter skepticism of scientific investigation and discovery while the simultaneous complete acceptance of Biblical historicity and inerrancy. Take for instance the talking animals in the Bible. The first and most famous is the talking “Serpent” (with legs originally) in the Adam/Eve story. In that case, although it isn’t mentioned there, Christians believe the serpent to be a manifestation of Satan. 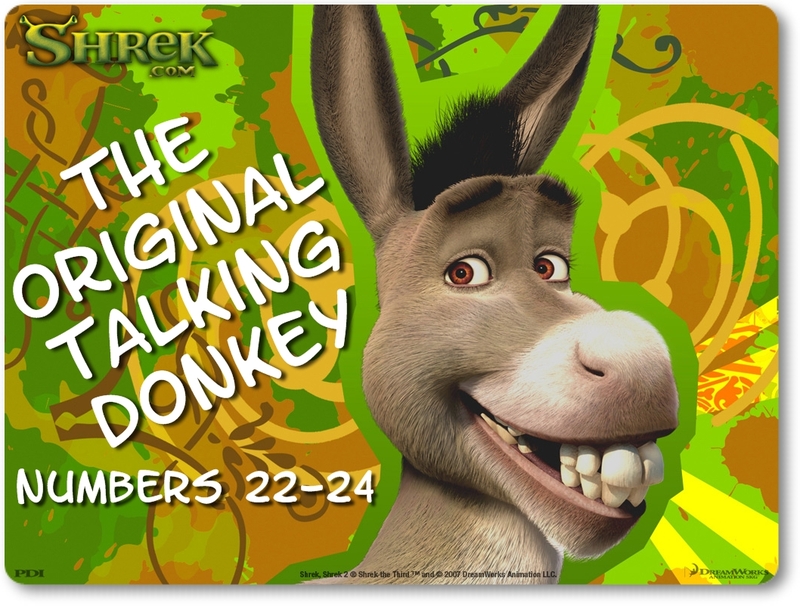 But there is another talking animal in the Bible (a donkey). But in this case, the donkey isn’t a mouthpiece for a supernatural being but rather speaks for himself (once God “opens his mouth”). Is the only thing preventing donkeys (or other animals) from talking some sort of physical limitation? Are they thinking coherent thoughts and complete phrases like this but are simply unable to express them verbally? After this story occurred, did Balaam’s donkey continue to talk? Did he become like the talking frog in the cartoon? Did Balaam take him around to various ancient carnivals showing off this amazing talent? Why did Balaam answer the Donkey as if he was having a conversation with a person? He doesn’t seem to be the least bit impressed that his donkey is talking to him. He threatens the donkey with death even AFTER the donkey speaks to him. Why doesn’t God do this now? If my pet started talking to me, I would have a pretty hard time explaining it rationally. But then again, why doesn’t God say anything himself? Maybe he should open his own mouth instead of Balaam’s donkey. Wats your point? Lol, it’s like your article just ends in the middle. Let me fill you in on something; people think that in order to find truth, they should choose whatever makes the most sense to them. Well the truth does not care what makes sense to you, people’s inability to accept truth will never have any effect on it.